The WMSBW06 series of AC/DC wall mount power supplies offers up to 6.03 watts of output power in a small 1.72” x 1.61” x 0.90” package. This series consists of single output models with a universal input range of 90~264VAC. 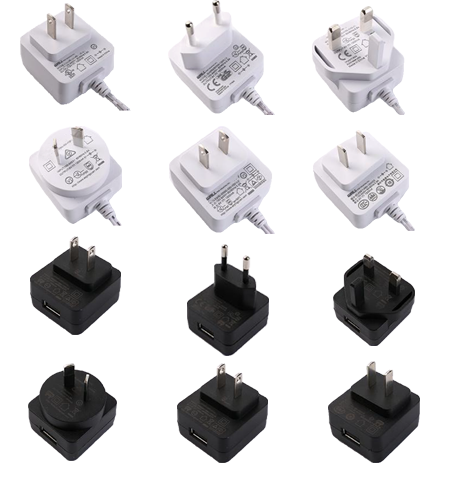 Each model can either have a US, EU, UK, Australian, Japan, or China plug, either a black or white case, and either a cord or USB outlet. This series features Class II construction, protection against over current and short circuit conditions, and RoHS, REACH, and Level VI compliance. It also has CE, CB, GS, UL (pending), FCC, SAA, C-Tick, RCM, PSE, and CCC safety approvals depending on model. Notes: 1. “X” in model number indicates plug type. “X” can either be “U” for US plug, “E” for EU plug, “K” for UK plug, “A” for Australia plug, “J” for Japan plug, or “C” for China plug. “Y” in model number indicates case color. “Y” can either be “B” for black or “W” for white. Cord version is the standard for this series. Add a “U” to the end of the model number to indicate USB option. 2. This product is listed to applicable standards and requirements by UL.